Got answers to questions that have cycled around my cranium for awhile. Have comments been shut off on Half Past Done? I was going to post the next question there, but couldn't see a place for comments. Did Tim complete the unsupported walk? I read the post about him but couldn't find a post about whether or not he finished. You can reply at joesuekeenan AT gmail DOT com if that's easier. Interesting program at Stanford. Physiology of adaptation to environmental stresses is one thing, as a genome scientist, I always look at genes beyond the phenotype. Gene variants that play a role in altitude and cold adaptation have been studied for a while and many are known. For instance, gene variants for uncoupling proteins (that are crucial for nonshivering thermogenesis) are thought to play a role in cold resistance. So you may be "blessed" with one of these rare gene variants. The rest of us will dream of moving to Hawaii while playing in the snow. Jill, found the post about Tim in April on the other blog. dude, lovin' the beach/bay pic! keep up the great work. Joe — no problem. I need to do some updating on that site. 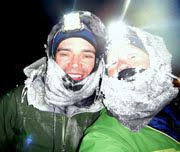 Tim did complete his unsupported walk in 2013. He's gunning for Antarctica now, but needs to secure some funding first, so he'll be back in Alaska in 2014. Love your writing, of course. 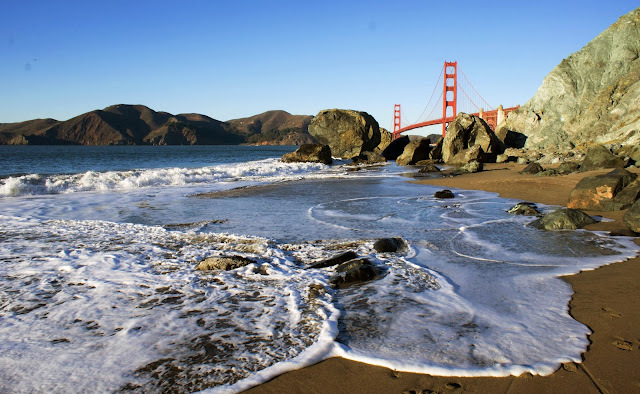 In this post, the photo of the GG bridge in the background with the beach and ocean in the foreground is breathtaking. Jill, in the story where you dunked your leg that froze, you mention two mistakes. What should you have done vs. what you chose to do?